It’s become common knowledge that large-scale disasters have become more commonplace around the world in recent years and that changes to the natural environment are continuing to accelerate globally. On the other hand, depopulation and the aging of existing populations are leading to so-called “marginal settlements” in which it is difficult to maintain economic and social lifestyles. These villages are becoming a societal issue. While at a glance these problems may seem to be unrelated, the keywords “biodiversity and human lifestyles” are deeply linked. My fields of specialization are landscape ecology and planning, and rural planning. In recent years, I've been making efforts regarding conserving biodiversity, the creation of sustainable rural communities, strategic roll-outs of green infrastructure, and eco-DRR (ecosystem-based disaster risk reduction). I was originally an agricultural major and studied the ecology of birds. I joined the faculty at the University of Hyogo from 1999, and while teaching at the Hyogo Prefectural Awaji Landscape Planning & Horticultural Academy, began researching dragonflies which live around irrigation ponds. Because Awaji Island does not receive much rain and has no large rivers, man-made irrigation ponds have been maintained since ancient times to ensure enough water for agriculture. These ponds eventually became a part of Awaji Island’s abundant nature, and while they create beautiful scenery and areas for a variety of living organisms to inhabit, they also play a multi-functional role in which they help to reduce flooding. They are also an extremely important part of the culture of the region and act as areas of social exchange. However, in recent years, the farmers in the area have been advancing in age, making it difficult to maintain these ponds. In the 9 years that I was there, the number of ponds that were impossible to maintain and that became abandoned steadily increased. Watching this situation unfold in front of my eyes lead to me becoming interested not just in living organisms, but in how human lifestyles and sustainable use of land have such a significant impact on the environment. As I began considering the creation of sustainable rural communities, I formed the Institute of Strategic Rural Reorganization (ISRR) in 2006. I was a member in the Ministry of Land, Infrastructure, Transport and Tourism’s “Long-term Perspective Committee” when the committee announced its predictions for Japan in 2050. Those predictions were truly shocking to me. The predictions stated that if rates of depopulation continue at their current pace, more than 60% of Japan’s territory will have a that is half or less of what it currently is today, with 21.6% of areas becoming completely uninhabited. Marginal settlements, or regions that cannot be maintained by their communities, are not easy places in which to live. I defined a “River-basin residential zone,” based on the flow of rivers and other bodies of water. Proposals were made to residents to leave villages which were hard to maintain in a planned manner, with these residents then moving to other villages which could be maintained for the next 20 to 30 years. This is the hope that this will lead to the revitalization of these communities. Of course, returning the vacated land to nature does not mean simply leaving it idle. It’s necessary to take action to ensure that they could be returned to nature while considering the environment. In order to gain the necessary funds and labor to do this, I’m currently researching whether it is possible to create a mutually beneficial relationship with cities located downstream from these areas. For example, cities have a large number of water sources flowing into them, with that basin of water being connected to a wide area. “Reasonable burdens” in the form of participating in maintaining the natural environment of upstream regions will be requested of the people of these cities. This will lead to these residents benefiting from an improved ecosystem and other natural benefits, one being water itself. Rural planning by vacating the land is based around the idea of pro-actively vacating from areas that are becoming depopulated, as opposed to passively waiting for them to disappear. This is both to protect the livelihood and communities in these areas, as well as improve the sustainability of these regions. The aim is to relocate these residential, monetary, and human resources to a river-basin residential zone, and revitalize agricultural communities. This pro-active vacating that leads to regional revitalization is called “rural innovation.” This will also increase the strength of these regions. The Kesennuma Reconstruction Project was started at Shonan Fujisawa Campus (SFC) directly after the 2011 Tohoku earthquake and tsunami, and continues to this day. The project involves research societies from various disciplines performing activities in their fields of specialization such as “information transmission,” “high ground transport assistance,” “architecture,” etc. 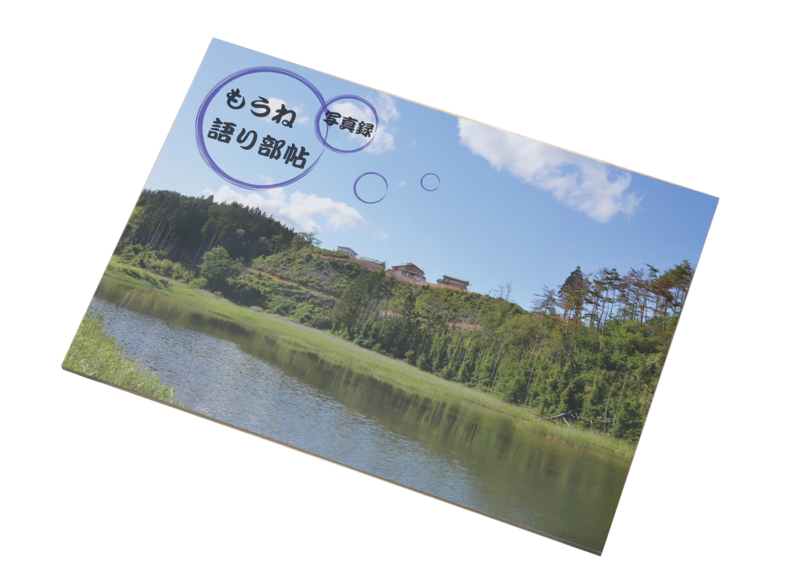 The Moune region of Kesennuma City originally contained a large number of ponds. The tsunami following the Tohoku earthquake caused an upheaval in the environment and lead to the formation of a large number of salt marshes. We began a periodic survey of the area from 2012 to understand what kinds of organisms were suited to and would live in this environment, and what kind of changes would occur. Our survey results were published in a pamphlet, and distributed to residents in the area. The area we were primarily supporting in Moune saw the last of its high-ground created in 2015, with most evacuated residents returning to the area in 2016. We are currently supporting this newly relocated community. 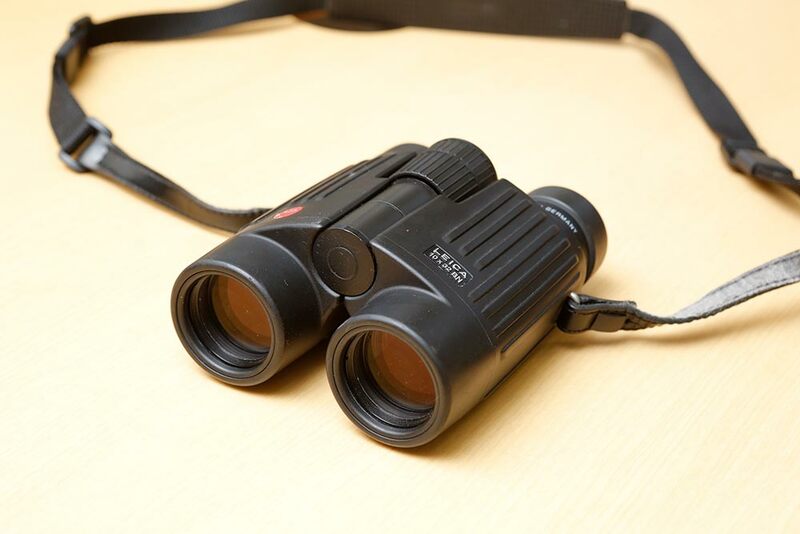 We are also performing periodic monitoring of the natural environment there. The high-ground relocation support is approaching the point at which its final results are beginning to be collated. In order to ensure that the experiences can be used for reference purposes for future disasters, we are also linking them to our research into eco-DRR (ecosystem-based disaster risk reduction). In January 2005, the “Hyogo Framework for Action 2005 - 2015” was adopted at the United Nations World Conference on Disaster Risk Reduction which was held in Kobe City, Hyogo Prefecture. In the proposal, disaster risks were stated to arise from physical, societal, economic, and environmental weaknesses and interactions, with disasters and risk management/reduction seen as themes that the entire world needed to tackle. The most important factor for reducing latent risk potential was deemed to be the suitable management of the ecosystem. This lead to “Disaster risk reduction based on the ecosystem” becoming a topic of focus worldwide, but it’s still unclear as to how we should go about evaluating and making use of the disaster risk reduction based on ecosystems. This research focuses on past natural disasters to reveal how natural ecosystems mitigate the disasters. Natural disasters occur in areas in which the use of land has led to habitat loss, and in which humans live and work. The more human activity there is, the more damage occurs in the event of a natural disaster. The connection between habitat loss and natural disasters is a close one. We are constructing a variety of geographical information systems for natural disasters both domestically and internationally, and are developing methods to evaluate the disaster risk reduction based on ecosystems, and methods for comprehensively cost-benefit evaluation. 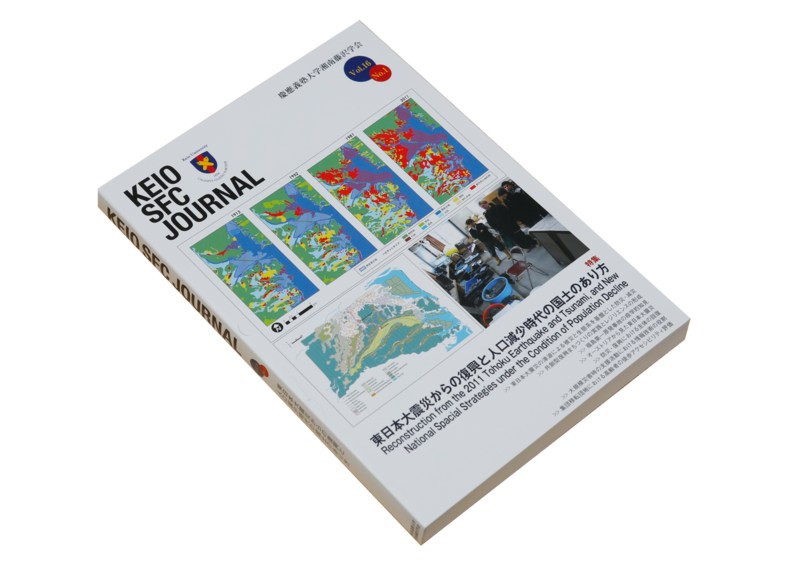 In order to both apply and verify these methods, we are performing a scenario analysis based around evaluating the disaster risk reduction, and methods for comprehensively cost-benefit evaluation in the Mikatagoko region of Fukui Prefecture. We hope to reveal sustainable methods for disaster risk reduction. Kesennuma’s previous habitat type distribution overlaps with the areas inundated by the 2011 tsunami. Areas that had once been mainly paddy fields in 1913 had been mainly converted to urban land use at the time of the tsunami. 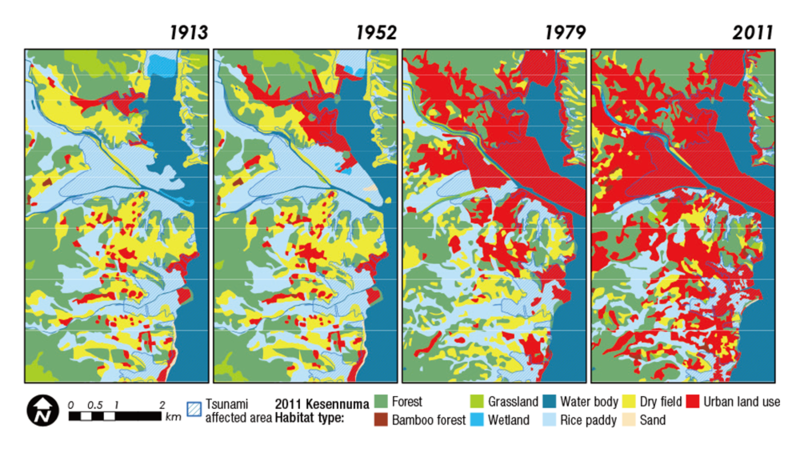 From this diagram, we can see that the use of this highly productive land lead to increased risks from a tsunami as time passed, and increased risks of damage. Agricultural areas act as buffer zones in the face of a tsunami. One of the benefits of ecosystems is their mitigation of natural disasters. In recent years disaster risk reduction efforts that make use of the ecosystem in this way (eco-DRR), have gained attention worldwide. These efforts began after the tsunami in the Indian Ocean, which lead to more than 200,000 people losing their lives. An analysis of the disaster showed that coral reefs and mangroves had a dampening effect on the tsunami’s power. 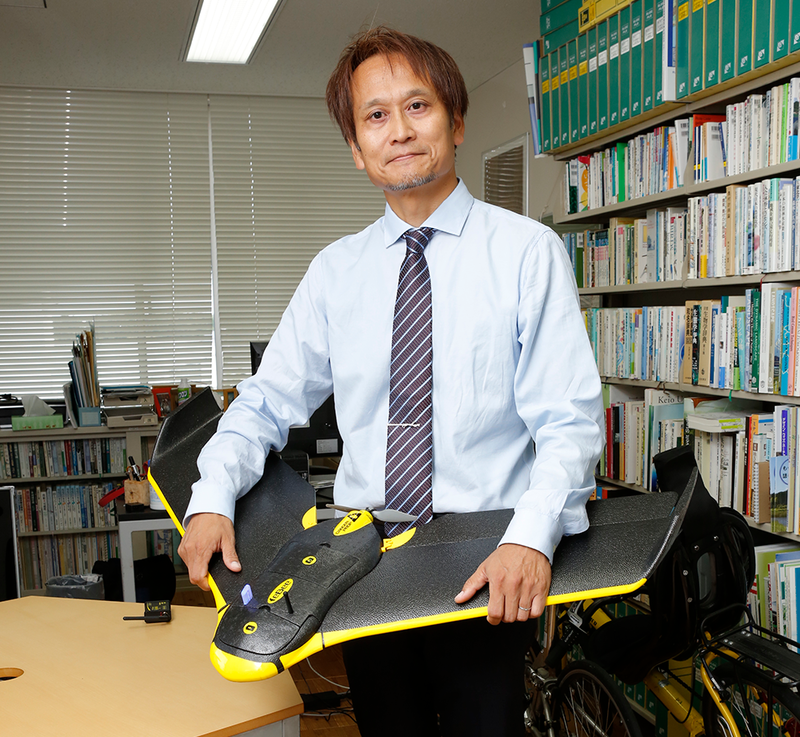 From ancient times, Japan has pro-actively made use of techniques and knowledge related to eco-DRR. However, population increases lead to more demand for food and housing, which meant land at risk of natural disasters had to be used. But as Japan is facing depopulation, there is no longer any reason to continue to use this risky land. Also, the costs required to maintain infrastructure are reaching their limits. The risks and environmental traits of different areas of land need to begin to be shared, and after taking into consideration city building, regional economies, and cost versus benefit, more focus needs to be placed on methods for using land in the most suitable manner. I want to combine the research results of my ecological planning, rural planning (including Institute of Strategic Rural Reorganization (ISRR)), and eco-DRR (ecosystem-based disaster risk reduction). I also hope to make proposals regarding sustainable land use planning methods, thus leading to them being used in society at large. 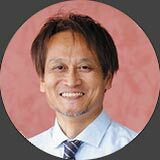 Professor, Faculty of Environment and Information Studies, Keio University. Graduated from Faculty of Agriculture, the University of Tokyo. 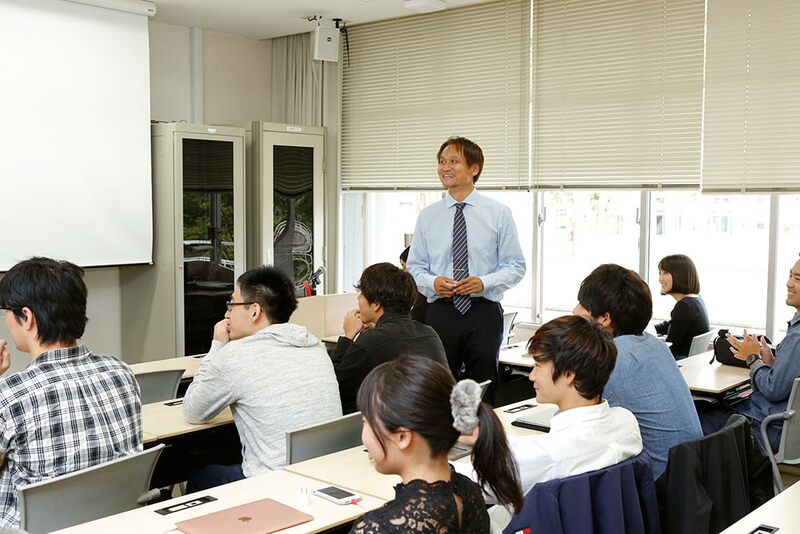 Completed the Doctoral Course at Graduate School of Agricultural and Life Sciences, the University of Tokyo. Ph.D. (Agriculture). 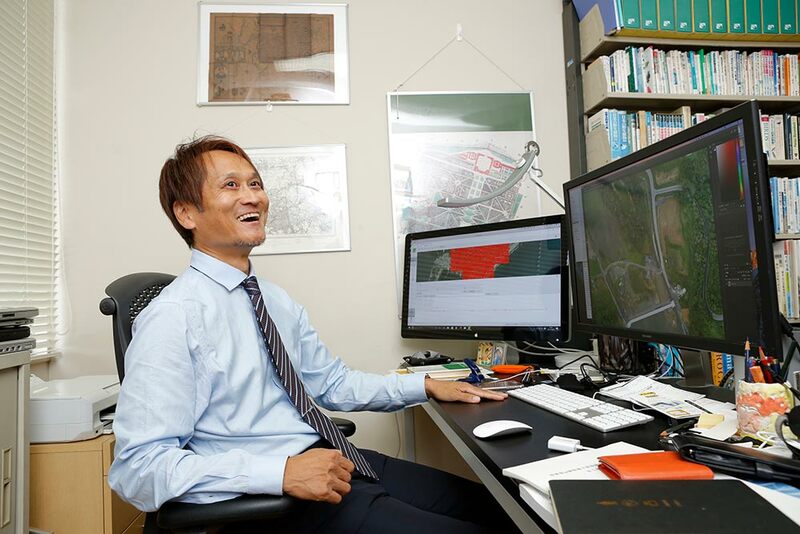 He began working at current position after working as Associate Professor at the Institute of Natural and Environmental Sciences, Public University Corporation of the University of Hyogo, Visiting Researcher, School of Planning and Landscape, the University of Manchester, and Associate Professor, Faculty of Environment and Information Studies, Keio University. Specializes in landscape ecology and planning, and rural planning.